The positive public reception of Melbourne Now and NEW14 reveals a growing appetite for contemporary art, which is currently being nurtured by the extraordinary contributions of VCA alumni and staff. Ross Coulter (Master of Fine Art (Visual Art), 2013) is coming up for air after his involvement in the National Gallery of Victoria (NGV)’s Melbourne Now exhibition. Coulter, who first came to public attention in 2011 when he launched 10,000 paper planes in the State Library, is representative of a cohort of VCA graduates who rather than focusing on one discipline prefer to work conceptually across a range of media. This year marked an important turning point in Melbourne’s cultural history as the NGV, headed by Tony Ellwood, made a concerted effort to realise the contemporary zeitgeist. The resulting exhibition offered an extraordinary prism into the city’s diverse practices, bringing together over 400 creative practitioners, including 85 VCA alumni and 18 staff. Over at the Australian Centre for Contemporary Art (ACCA), the NEW14 exhibition featured the work of alumni Taree Mackenzie (Bachelor of Fine Art, 2008), Andrew Hazewinkel (Master of Fine Art, 2001), and Kenny Pittock (Bachelor of Fine Art (Honours), 2013). The show’s curator Kyla McFarlane says high attendance at both NEW14 and Melbourne Now is evidence of the city’s interest in contemporary art as well as the breadth of local talent. “Both shows reveal a lot about the density on the ground,” she says. Murray believes VCA graduates are paving their own way and making things happen on their own terms. “I think there was a time when you waited to be discovered,” she says, reflecting on 1970s art scene. 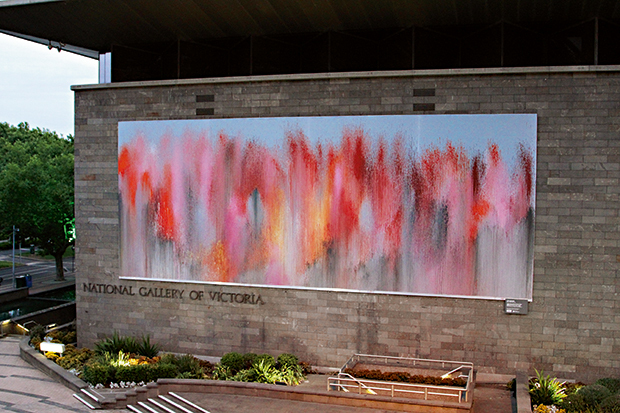 “In those days you were being presumptuous if you wanted to show your work before your thirties.” Murray says it’s taken commercial galleries a while to understand what’s happening — that the city wants to be exposed to more contemporary art — and importantly, it’s these artists who show us what’s relevant in Melbourne now.